STOP Identity Thieves Dead In Their Tracks! keepmyID is the only service that actually prevents identity theft. All the others are just monitoring services. When you enroll with us your credit is put on lockdown! An account can’t be opened without your OK. keepmyID is your first and last defense against identity theft. Enroll Now! We’re different. Other companies just monitor. Once they call you, it’s too late. Our goal is to prevent your identity from ever being stolen. 1. WE BLOCK ID THEFT. A lawyer is personally assigned to you to put continuous legal blocks in place. Our competitors just “monitor” your credit and block nothing. 2. WE COVER ALL ID THEFT. Our competitors just cover Financial ID theft (51% of ID Theft). We cover 100% of ID Theft: Financial, Medical, Criminal, Tax, Employment, Benefits, Social Security, Child/Elderly, and Family. 3. WE PROVIDE $1 MILLION IN COVERAGE AND DO ALL THE WORK. Our competitors make you do the work — “how to” directions. We do ALL the work for you. We also guide you in all the identity fraud protection services and identity theft protection. 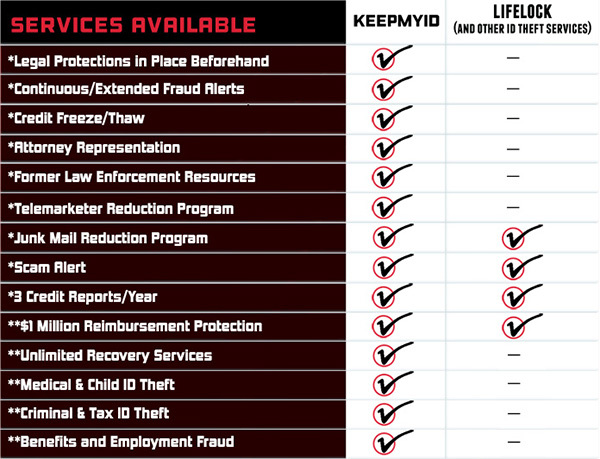 COMPARE IDENTITY THEFT PROTECTION SERVICES AND YOU WILL SEE…WE PROTECT YOUR IDENTITY BETTER THAN ANYONE ELSE. PERIOD.